3 different 3D boards are waiting for you! You can now enjoy the game you know and love on either a City themed, an Amusement Park themed or a Haunted themed board. 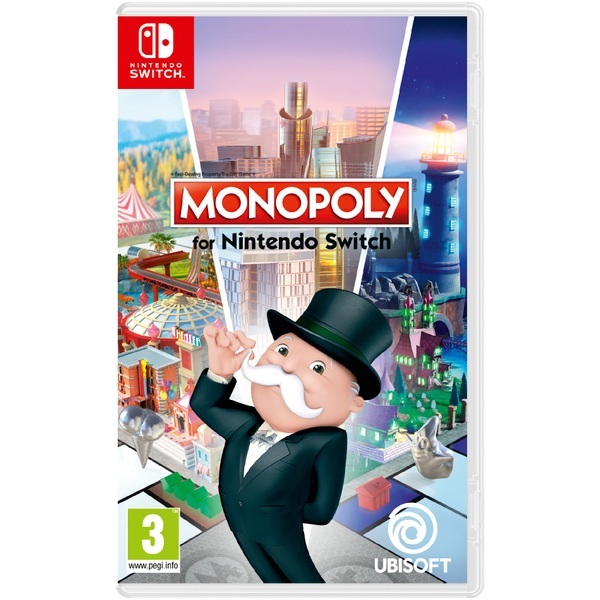 Thanks to the Nintendo Switch, you can now enjoy MONOPOLY wherever you want! Play at home on your TV screen or on-the-go in tabletop mode, and feel the dice as if they were in your hand! Play the way you want by selecting one of the 6 official House Rules chosen by MONOPOLY fans from around the world! The Speed Die mode is also available to make you progress faster around the board. Not enough time for a full game? Choose a new objective from our 5 Special Goals! Spice things up with Actions Cards and take control over your own destiny! Draw 3 of them at the beginning of the game, and play them wisely during the game so you can progress faster around the board, penalize your opponents or get extra money! Take on new challenges and unlock unique tokens! Find other players online and challenge them in quick matches, or in customized sessions choosing your way to play! Try to be the one to own it all! Now is time to own it all on Nintendo Switch™! Your favorite family board game is coming to Nintendo’s new console! Discover amazing lively 3D boards, exclusive tokens and many more surprises in MONOPOLY for Nintendo Switch! Enjoy new ways to play at home or on-the-go with up to 6 players! Twist the game with Special Goals to shorten your play sessions, and Actions Cards to influence the course of events!